Did you know that pumpkins are part of the Cucurbitaceae family which include melons, cucumbers, gourds, and squashes? That’s right: pumpkins are related to cucumbers. Neat, right? As a cucurbitacin, pumpkins are high in phytonutrients that will help keep you healthy and well throughout the fall season. But that means you have to eat them, not just take pictures of an orchard or create jack-o’-lanterns with your kids. Sadly, that just won’t cut it. Healthy because it’s orange. The more colorful the food, the better they are for you. If only it were that simple. Well, actually, it often is, with several exceptions of course. Don’t toss out that cauliflower or onion just yet. The orange hue of the pumpkins’ skin and flesh is due to specific phytonutrients, chemicals found in plant foods. The phytonutrient category that lends the orange color to pumpkins are carotenoids which include specific chemicals you may or may not have heard of such as beta carotene, alpha carotene, lutein, lycopene, and others. Is there another vegetable that you can think of that is orange and might have carotenoids in it? But how are pumpkins healthy? Due to the nutrient profile of pumpkins, this winter squash variety, like most winter squash varieties, is an anti-inflammatory and even an anti-cancer food. 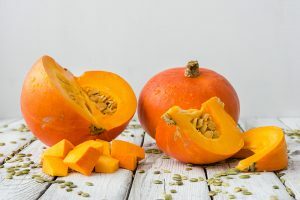 While most of the studies on winter squash’s benefits for health have been conducted on laboratory animals, there have been numerous studies on the various nutrients in pumpkin that support the claims made here. One of the many benefits that the beta carotene nutrient in pumpkin provides for our bodies is reducing organ damage brought on by oxidative stress in the body. What causes oxidative stress? A poor diet, smoking, drug use, and environmental pollutants are among the sources. And what does oxidative stress lead to if left unchecked? Disease and possibly cancer. Some studies show that adequate or higher levels of carotenoids may result in a reduced risk of pancreatic cancer and a reduced risk of breast cancer for women. And, there is adequate research to show that the nutrients found in pumpkin have been shown to improve blood sugar regulation and possibly improve cardiovascular health. Even iron deficiency anemia may be prevented or treated with vitamin A supplementation and pumpkin has plenty of vitamin A. So what are you waiting for? Start pump(kin)ing up your health today! Decent source of: Manganese, Phosphorus, and Potassium. Bonus: Pumpkin has minimal amounts (but an amount nonetheless) of all of the essential amino acids. Heat a pan on low heat and spread coconut oil on the pan. Dice the pumpkin, not including its thick skin, and cook on the pan on medium heat for 10-15 minutes. Pre-heat on medium heat a small pot and while pumpkin is cooking, mix oatmeal and the milk of choice in pot, cover, and cook for 10 minutes. When oatmeal is almost done, mix cooked diced pumpkin into oatmeal and stir. Add cinnamon, salt, and maple syrup. Jansen RJ, Robinson DP, Stolzenberg-solomon RZ, et al. Nutrients from fruit and vegetable consumption reduce the risk of pancreatic cancer. J Gastrointest Cancer. 2013;44(2):152-61. Esrefoglu M, Akinci A, Taslidere E, Elbe H, Cetin A, Ates B. Ascorbic acid and beta-carotene reduce stress-induced oxidative organ damage in rats. Biotech Histochem. 2016;91(7):455-464. Jayaprakasam B, Seeram NP, Nair MG. Anticancer and antiinflammatory activities of cucurbitacins from Cucurbita andreana. Cancer Lett. 2003;189(1):11-6. Eliassen AH, Hendrickson SJ, Brinton LA, et al. Circulating carotenoids and risk of breast cancer: pooled analysis of eight prospective studies. J Natl Cancer Inst. 2012;104(24):1905-16. Wilfredo Benitez is a student in the Master of Science in Nutrition program at National University of Natural Medicine. Will helped staff a Food As Medicine Everyday series during the summer of 2016 and found much value in the program. He is excited about the opportunity to bridge his education background with nutrition to work to improve the health of children, families, and communities.